As of January 2019, 14 states have submitted proposals to the federal government requesting permission to establish work requirements in their Medicaid programs. To date, the U.S. Centers for Medicare and Medicaid Services (CMS) has approved Medicaid work requirements for seven states, and two states (Arkansas and Indiana) have begun implementing these requirements for Medicaid beneficiaries. In June 2018, Michigan enacted work requirements for many enrollees in the Healthy Michigan Plan (HMP), Michigan’s expanded Medicaid program for low-income adults. 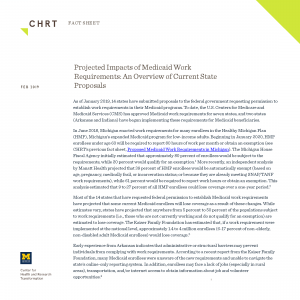 Beginning in January 2020, HMP enrollees under age 63 will be required to report 80 hours of work per month or obtain an exemption (see CHRT’s previous fact sheet, Proposed Medicaid Work Requirements in Michigan). The Michigan House Fiscal Agency initially estimated that approximately 80 percent of enrollees would be subject to the requirements, while 20 percent would qualify for an exemption. 1 More recently, an independent analysis by Manatt Health projected that 39 percent of HMP enrollees would be automatically exempt (based on age, pregnancy, medically frail, or incarceration status; or because they are already meeting SNAP/TANF work requirements), while 61 percent would be required to report work hours or obtain an exemption. This analysis estimated that 9 to 27 percent of all HMP enrollees could lose coverage over a one-year period 2.